By Josie Hollingsworth on Tuesday, April 2nd, 2019 at 9:00 a.m.
International Fact-checking Day isn’t just for the fact-checkers. It’s for you, too. On April 2, the Poynter Institute -- the nonprofit that owns PolitiFact -- is celebrating facts and equipping citizens, journalists, professional fact-checkers and educators with resources to help separate fact from fiction. 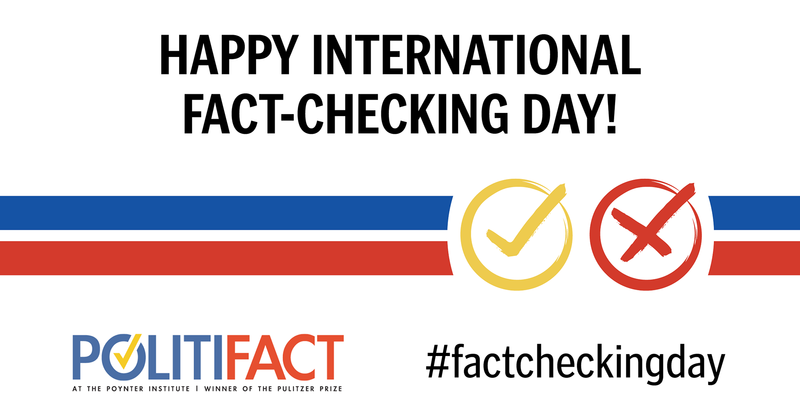 The hub for International Fact-Checking Day activities is FactCheckingDay.com. The site is hosted by another Poynter-based project, the International Fact-Checking Network, a group founded in 2015 to bring together the growing number of fact-checkers around the world. "In our interconnected society, misinformation knows no borders," said Baybars Örsek, the network's director. "With online conspiracies fueling violence in India and Brazil and disinformation campaigns targeting elections in the European Union and the United States, fact-checking must expand to every corner of the earth. But fact-checkers can’t do it alone. International Fact-Checking Day is all about teaching the tools and methods that fact-checkers use to fight for the truth to the average person so they can be more critical consumers of information." • Participate in an AMA with PolitiFact on Reddit today at noon ET. • Go behind the scenes with Poynter’s fact-checkers on Facebook Live at 2 p.m. ET on April 2. Ask us your questions here. • Stand up for the facts — become a PolitiFact member and receive your Pants on Fire sticker. • Polish your skills through Poynter’s Hands-on Fact-Checking Short Course, a free, online 90-minute course on fact-checking. • Follow and encourage middle school and high school students to follow) MediaWise on Instagram. Use #IsThisLegit to flag questionable posts. • Make a donation to Poynter to support fact-checking through the IFCN, MediaWise and PolitiFact. • Visit the YouTube Learning channel "guest picks" playlist on YouTube for a series of videos created by the MediaWise project and the International Fact-Checking Network. • Contact Poynter to receive a press release to cover Fact-Checking Day for your news organization. • Wisconsin Sen. Tammy Baldwin said 29 states still don’t have "comprehensive protections" for people in the LGBTQ community. Her numbers are on the money. • For Cabinet posts, Sen. Kirsten Gillibrand has "the best voting record against Trump nominees of anyone else running for president." She has voted against 27 of his nominees, while Warren and Sanders have opposed 26. Booker and Harris voted against Trump Cabinet nominees 25 times, and Klobuchar voted against them 17 times. • A local sheriff in North Carolina said an ICE detainer request "is not a valid warrant." He’s absolutely right. Poynter: Want more facts in politics, journalism and everyday life?